HomeNews EDITION 2016 – SEE YOU THERE! EDITION 2016 – SEE YOU THERE! As always when it comes to Olympic year, a small problem is finding the best terms for the academy. 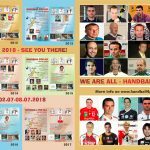 After discussions with the lecturers, we are free to announce “Handball4all” edition 6, in our already “established term” – last week of June, more precisely in the period from 27.06-03.07.2016.